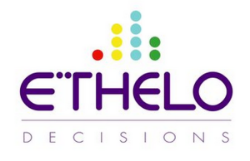 Ethelo Decisions is revolutionizing the way the world says “yes” to a solution. The decision optimization and stakeholder engagement tool is powered by the drive to create intentional social change in a democratic fashion. In complex scenarios, the interests of a large stakeholder group must be fairly balanced. These situations are broken down into issues, which stakeholders can comment, share and vote on. The patent-pending algorithm is based on social preference research which suggests that people value a fair process even if the end result puts them at a slight disadvantage. Ethelo analyses the nuanced data and provides unifying recommendations for decisions.